“According to a Q4 2012 analysis by Experian CheetahMail of its North American clients’ email campaigns, emails sent late at night outperformed emails sent any other time of day. Experian found that emails sent between 8 p.m. and 12 a.m. generated higher open and clickthrough rates, more transactions, larger orders, and greater revenue per email than emails sent during any other time of day—and by a significant margin. Just as senders benefited from off times, so too did they benefit from sending on off days of the week. 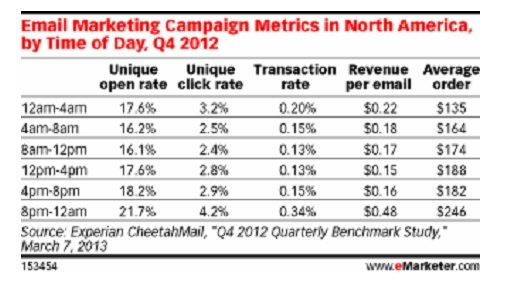 Opens and clickthroughs were highest on Saturdays and Sundays, Experian found.” – From April 1, 2013 eMarketer report.